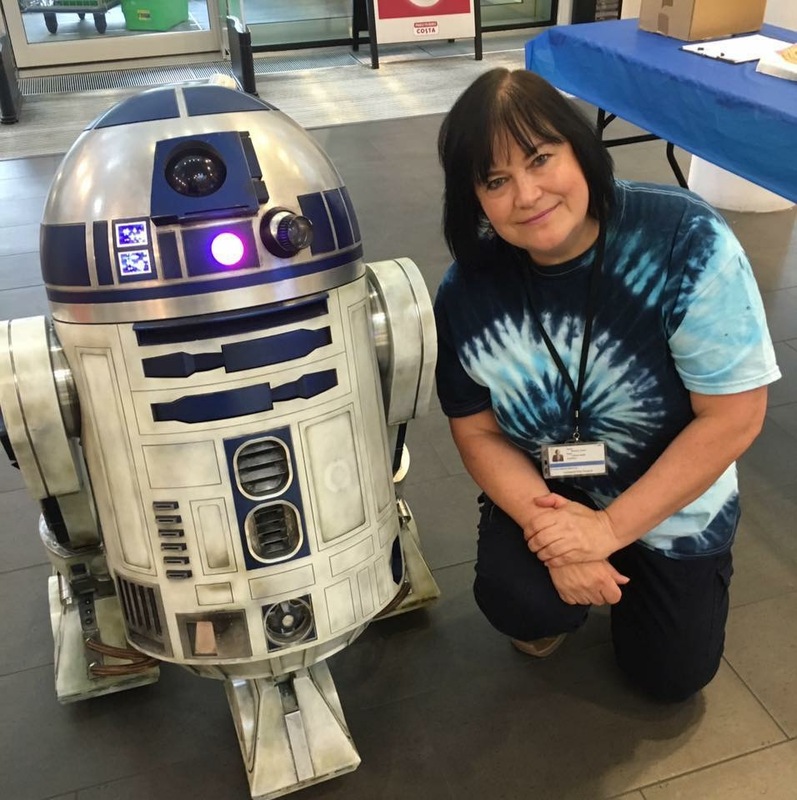 Denise with one of her celebrity friends R2D2. Hello everyone, it’s getting really close to MakeFest now. Only… hang on… (counts on fingers)… 9 sleeps till the big day! I hope you’re as excited as we are over here at MakeFest Manor. We’re so excited in fact that we’ve gone mad and combined Throwback Thursday with MakeFest Memories for today. We can’t decide whether to call it Throwback Memories, MakeFest Thursday or who knows what. Never mind we’ll figure that out later. Today we have some brilliant MakeFest Memories from one of our original founders, Denise Jones. You’ll have read in previous posts by Mark and Caroline how meeting Denise was the catalyst for the creation of the event. So we weren’t going to let the MakeFest Memories series finish without hearing from Denise herself. As if! Not to swamp us immediately in my social media world but #Iamalibrarian is a simple hashtag that means so many things. Realistically though, I didn’t think that one day I’d be moving over from my general arts based background into something more techy. Don’t get me wrong, librarianship is an information science and public libraries embraced technology from the off. Most of the staff are well ahead of the game in that respect with all of them holding a digital qualification, using technology to deliver services on a daily basis and helping the public with digital inclusion issues, more so than ever now. But something happened that transformed my ideas about how to connect the dots with digital technologies and our library cultural and learning offers. Plans for a “small festival” quickly changed! You know when you meet some people and you just ‘connect’ because you realise you think the same way and their excitement, vision and enthusiasm matches your own? Well that happened when I bumped into Mark Feltham and Caroline Keep. I was standing there minding my own business watching a lantern making workshop and chatting to a Councilor. Those who have met me will know I like to chat a bit… And then they appeared as if by magic, like the shop keeper in Mr Ben, Mark and Caroline, who started to talk, physics, drones and Raspberry pi and Arduinos. To be honest I was impressed and who wouldn’t be, because we all know they are pretty cool. But luckily I did know what they were talking about because I’d been brought up with 3 brothers and tended to play with their Lego, chemistry sets and pogo sticks rather than the girly stuff I’d been given. I actually have one particularly gadgetry and geeky brother who always had the latest tech, still does, he’s currently retro gaming on Pi’s. I also have two sons, two gaming tech savvy sons who keep me in touch with everything. But I’ve gone off track a bit here with background stuff in an attempt to prove my digital credentials, suffice it to say I’ve always been a bit geeky. So yes, I had an inkling of what they were talking about, and when the question came of ‘who would be the best person to talk to about hosting a small festival, I realised this could be something good and of course the answer was ‘me’. I sold it hard to the library powers that be, to be honest with a bit of explaining and persuasion they were very up for it, and as for a ‘small’ festival, well that went out of the window in the first week. When the day came and all the hard work came to fruition and everyone in library world thought I’d lost my marbles, seeing the library transformed into something it had never been and something so fabulous gave me great pleasure. The impact on the library was massive and made a real difference with so many new partnerships, events and activities, but that’s for another blog. The best thing about MakeFest, people having fun and learning stuff too. That’s not my key MakeFest memory. Mine is a simple one really that repeats itself every year. It’s standing on the perimeters of the Discover Library in the middle of every MakeFest and just taking a moment to watch the hustle, bustle and activity, see the excitement and interest on the kids’ faces and the families engaging with something together. 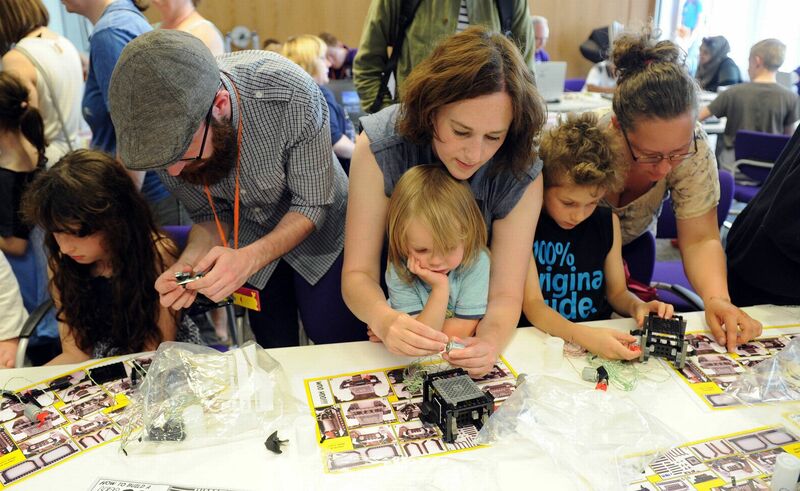 Makefest is not a passive event, nor an event where the parents and carers watch their young ones taking part. It’s about real participation and introducing people to possibilities. And ‘it’s all about the people’ – my tagline. The glossy bits and pieces, equipment and tech isn’t the end in itself, it’s the creativity of the people behind and in front of the tech. People who want to make things, including a better future for themselves and others. Personally the impact on me has also been massive, I’ve found a new space to be, new interests, always handy for the constantly curious. I’ve found friendships and importantly how I think of the future of libraries and the role they can play has completely changed. Chatting to Lol Baker in the LJMU Fab Lab last week we agreed that you reach a stage in your career when it’s less about prospects or money and more about legacy. 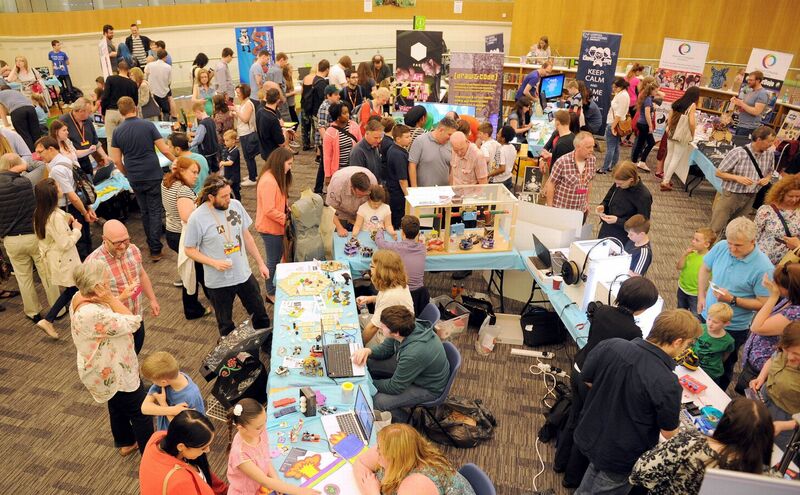 Makefest has a great legacy and the fact I was able to play a part in building a MakeFest community is something, like everyone else involved, that I’m really proud of. So yes #Iamalibrarian but now I’m also a bit of a geek, a library ninja, karaoke queen, event organiser, trouble-shooter and I’ve learned how potentially life enhancing a Raspberry Pi can be. Oh and don’t forget I’ve got a special hat, what’s not to like about a special hat? Thanks Liverpool Makefest. This librarian loves you! Thanks to Denise for sharing her MakeFest Memories. Follow her on Twitter for lots more updates. We have to agree, who doesn’t love a special hat? Mr Ben definitely did. Also, the festival is entirely staffed by volunteers and we’re always looking for people to join our team. Don’t be put off if you’re not a technical expert, everyone has valuable skills to offer and it’s fun too. SIGN UP TO VOLUNTEER HERE. I’ll be back with one more Meet The Makers podcast on Monday and then it’s the big day, whoop! Next Are you there mother? It’s me MakeFest.